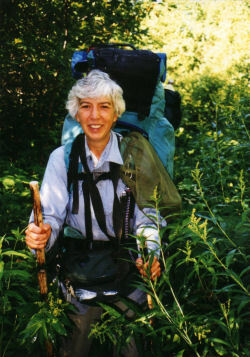 Friend Cathy and I went for a walk again today, but I didn't wear the big pack. 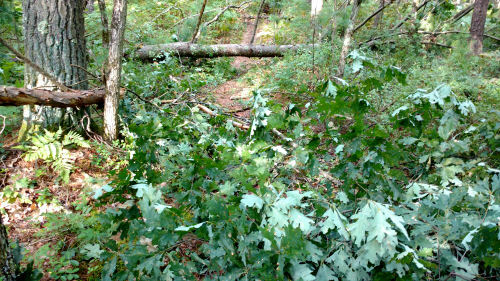 I needed to get out and check my section of trail to see how much storm damage was there. There were 4 trees that we couldn't move. This was the worst down tree. I took pictures and the GPS locations of all the ones we couldn't move and sent them to our trail crew that is chainsaw certified. There was a lot of small stuff down, of course, and we cleared all that and a few larger broken trees that we were able to move ourselves. We might have been able to move one of the ones we left, but it was going to be a test, and we knew someone was going to have to come with a chain saw anyway, so we left it. This is just one of my favorite pieces on my section. You've seen it before. It's an old rail bed through a swamp. 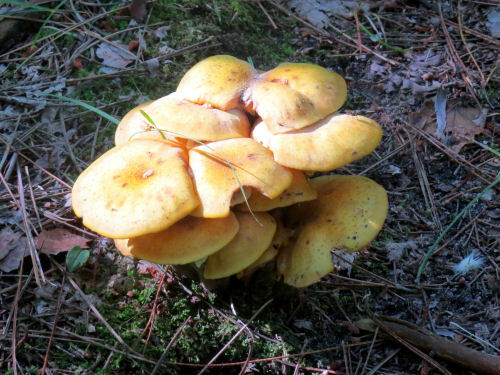 We saw this big clump of golden mushrooms. And these little white ones. 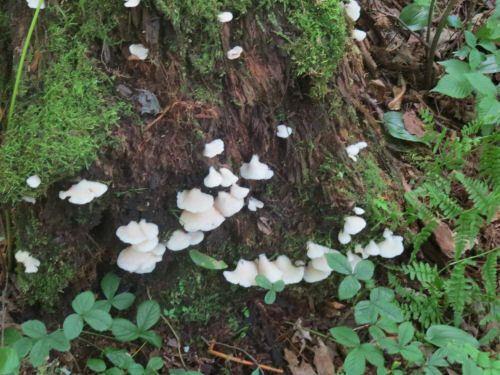 They might be oyster mushroom (or not). I didn't even take a selfie. Oh well. We were hoping to do all of my miles, but when you are clearing up a big mess it just takes whatever time it takes. 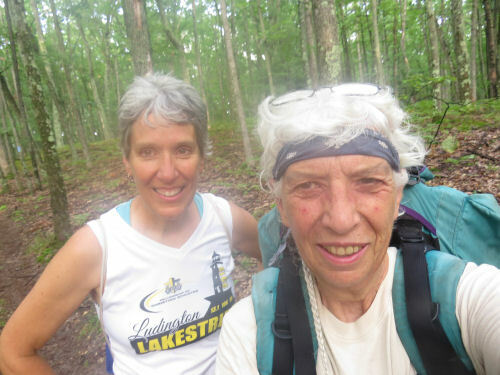 Hike 100 Challenge is at 67 miles. In other news: I got fed up with the horrible mess the dining room has been since I emptied my trailer into it over a year ago. Spent all day working on that. Not done. The reason I got fed up is that I needed the table space to sort hike food. Found the table, and packed up a very few things- not enough to even report yet, but I got a start. And I did laundry. Not bad! Cures Poison Ivy and ??? Curiosities while shopping, part 729. 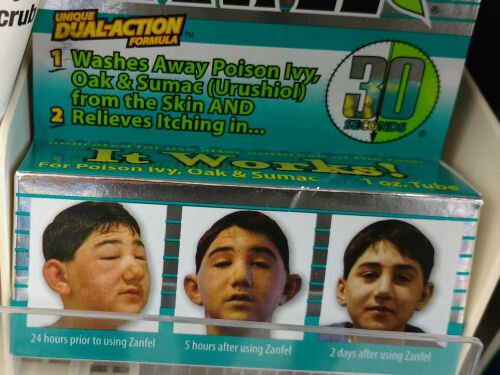 This product claims to cure poison ivy. That was not the problem my shopping was seeking to address, but I have to candidly admit I was impressed. I've never seen a product that could also, in addition to the poison ivy, cure a big nose and jug ears. All this in only two days. Amazing. 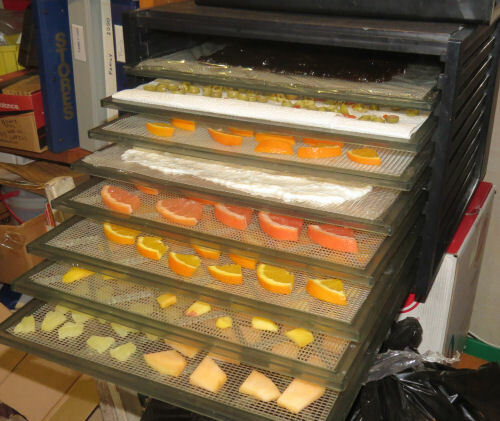 I did start shopping for the hike today, and have (almost) filled the dehydrator for its first round. I only managed to come up with 8 trays (instead of 9) full that will take all night to dry. (from the bottom up-- melon, pineapple, peaches, oranges, grapefruit, yogurt, minneolas, olives, jam) That's fine. I'm not in any panic time-wise. Here are my cold meals for the hike. These will also each be served twice. It gets expensive to buy supplies when you only use part of them. Of course, I'll eventually use the rest of the food, but given all the trouble we have with grain moths and mice I'd just as soon use it up sooner. salad is my own invention- it's red and will knock your socks off! In other news: I worked half day at Shagway, wrote a chapter in DMS Mistletoe, did errands and shopping. I didn't feel well part of the day and am kinda ache-y tonight. Bed early maybe. Maybe I'm back in the groove. First, the damage assessment here. It doesn't amount to much. 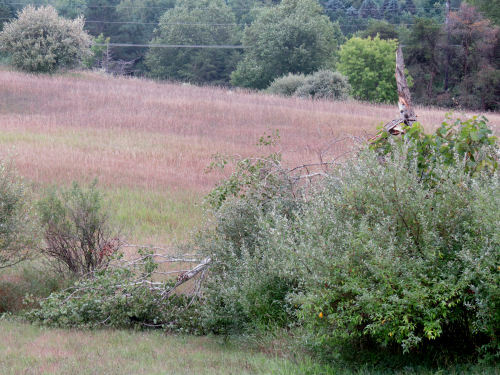 One of the quaking aspens, which had already partly broken, snapped. Not a big deal. I'll see if I can clear it out alone when things dry out a little. That's it. I'm very fortunate compared to many in the county. Walked 3 miles with 33 pounds in 54 minutes. Not bad. One hip was a little sore. Again, not a big deal. In other news: No writing happened today. Need to get back into that groove, too. The big excitement of the day was the storm last night. Lots of wind. 0.75 inch of rain. Power went out. It didn't get restored until mid-afternoon. 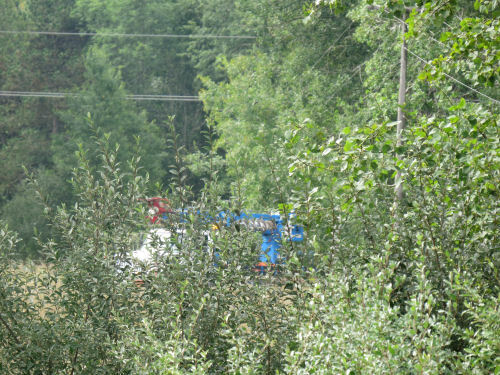 The problem was a wire down way out by the railroad tracks. Somehow, we were the only house affected (in this immediate area). The day cleared up, but now there is a second line of severe storms rolling through that may spin up some little tornadoes also. Whoa! But I went to writer's group, where we lost power within 10 minutes of starting, so we all went home. The streets in Ludington were flooding fairly deep and there seem to be a number of blocks without power. High winds (although I haven't seen anything yet as strong as they were here last night). Another 3/4 inch of rain in the last hour. Now it's just raining gently. Hope we don't lose power again. So much for the excitement. Now for the apathy. I have done almost nothing except read books for three days now. I may be able to blame it on the extremely heavy air. Or today I can say I didn't want to run down the computer battery. Or maybe it's just because I can't manage to accomplish things unless there is a screaming deadline right in my face. Or maybe I am just lazy. I suppose we'll see what I manage to do tomorrow. Not much to show you today. We got two inches of rain last night, and it's raining again now. I actually got some cleaning done and was interviewed for a trail podcast. This grass is really atractive. 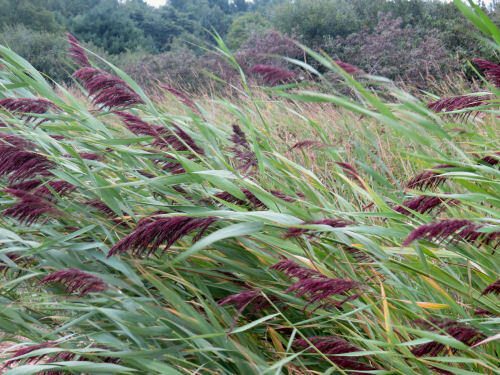 I used to be pretty sure it was Echinochloa crus-galli, a type of barnyard grass or millet. But I'm no grass expert, and I can't say that with certainty. I do know it's considered a nuisance. Any grass experts who want to correct me, feel free. This is absolutely not a change of philosophy or anything except the old pair of shoes is worn out. Here are the new ones. 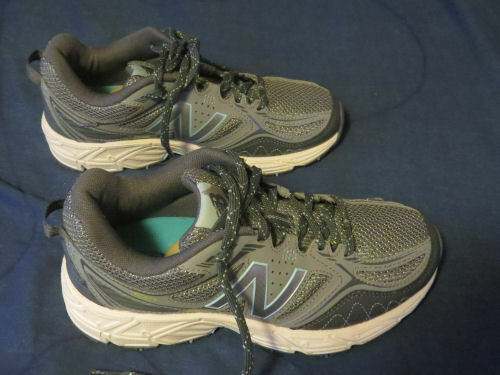 New Balance trail runners, purchased on closeout. The New Balance lasts fit me quite well. There never seems to be any break-in time. These are a different number, 510s instead of 860s, but it doesn't really matter what that means because this is the pair I could get and they fit. I did have to go that extra half size bigger because of my one stupid toe (see link below), but I haven't been tripping on my feet in the regular sneakers, so it should be OK.
You might recall that I compared the heels of the pair before the current pair and was surprised at how run-down they were. (see link below) Well, I exceeded that this time. I was thinking I could get by with the pair I had for this one more hike. Then I started looking at them (because Marie talked me into it). Wow! There are holes all over the tops, and the heels are even worse than last time. Here are the new pair with the current pair- two years of use (not bad for inexpensive shoes). And there was another problem, although I knew about this. 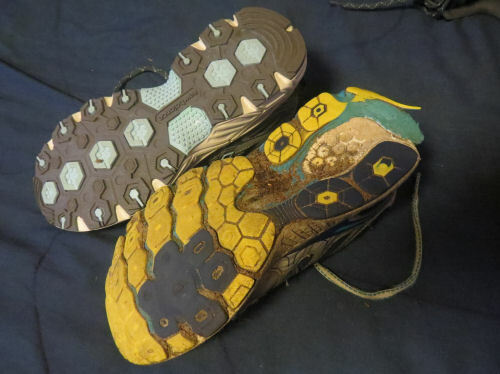 I always replace the insoles that come with them with gels. All summer long, I have not been able to get the regular gels. Fortunately, the store finally had them, so the new shoes are all ready to hike. Too bad they won't be this clean for very long. Here's how bad the old gels are. 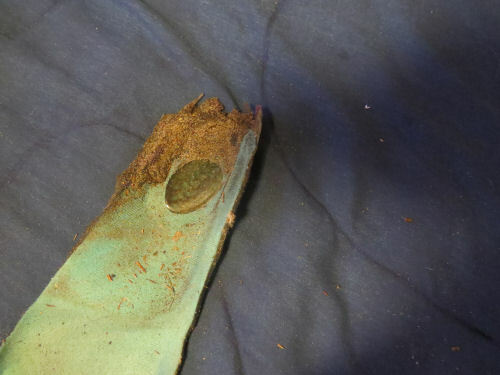 The heel is worn completely off! In other news: I just couldn't get started today. I finally dragged myself to the store because I'm trying to solve a storage issue in my bedroom, and as soon as I stepped outside I knew why I was so tired. The air was like soup. Of course, now it's cooler (and thundering and lightning) and I feel like doing something. Anyway... did a little cleaning, a little sorting, a little writing. Most of the emphasis is on little. I treated myself to a movie- $3.74 at Walmart. The Judge with Robert Downy, Jr. and Robert Duvall. It's a really powerful movie. Not sure why I hadn't even heard of it. Rated R, mostly for language. 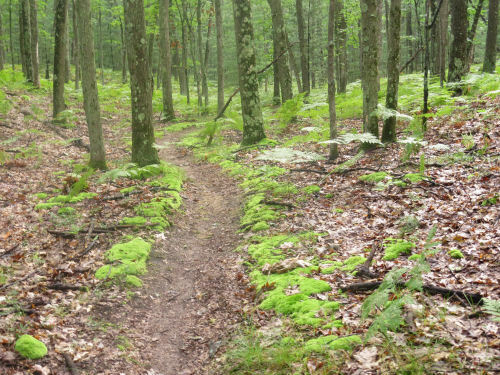 This evening, a long-time, but not much seen, friend and I went for a North Country Trail hike. We went out to the trail at Timber Creek and hiked about five miles. I did it with 30 pounds, and it felt fine. It was about enough for one shot without a rest, but no problems. Guess I'd better move up to 32 pounds! The all-day rain made everything green and lush in the evening light. Probably Cathy and I won't call this a favorite picture, but we were having fun. 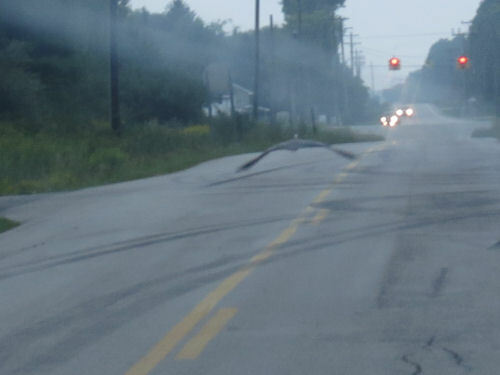 The most fun (only) wildlife sighting was driving home where a blue heron was winging down the road ahead of me. Not a great picture through a dirty wet windshield, but you get the idea. It had the good sense to stop and get off to the edge before we reached the highway. Cathy and I may try to get together fairly regularly to do something. Now... some of you that keep saying you would like to hike with me, please don't get bent out of shape. Sometimes adventure buddies just work out due to proximity of where people live, schedules, time of life, pace, etc. Anyway... we may try to do this again. In other news: I did a book vendor event at Shagway Arts Barn today that was surprisingly all right despite the rain. And now, I think I'm taking my book and going to bed. Last week, one night when I couldn't sleep there was a very bright spot in the southern sky. It was so bright, I decided to see if I could get the camera to focus and figure out what it was. Focus was beyond my camera's capabilities. 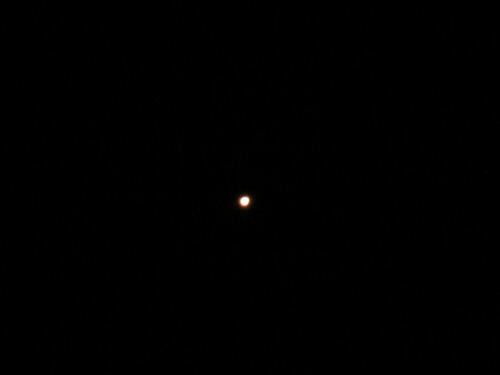 I think it's Mars, but if you are an astronomy buff, feel free to correct me. This is how bright it was without much magnification. 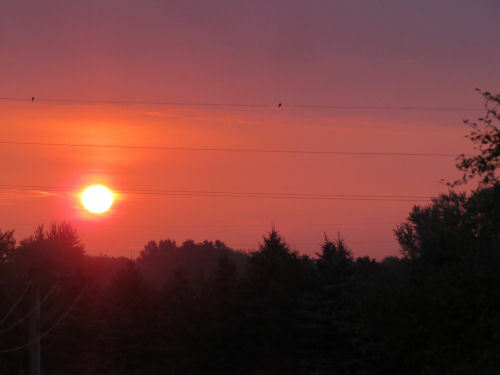 Just another day later, the sunrise was intensely red. The warning part didn't pan out, though. Still no rain. However, I liked the paired birds. 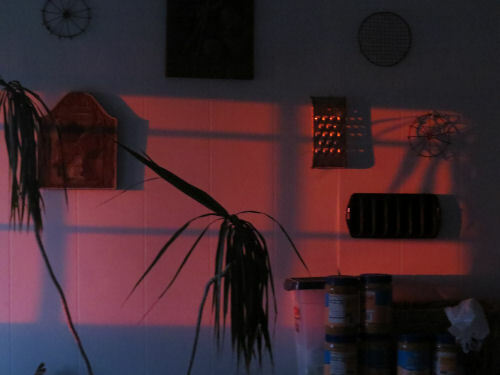 The light from this sunrise was so red it colored my kitchen wall. And all this dry weather is stressing the plants. They think it's fall already. 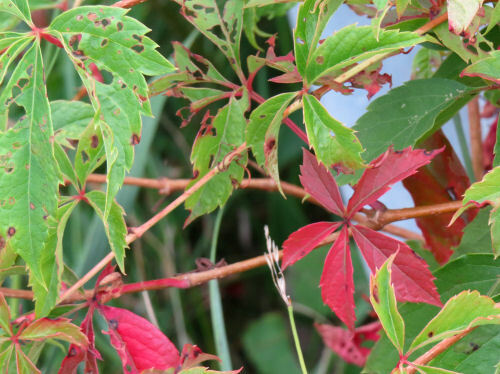 Virginia Creeper already turning bright red. In other news: I did a whole bunch of stupid little tasks that don't leave me feeling as if I've accomplished anything. I worked a little more on my hiking menus, and then walked 5 3/4 miles with no pack. I decided to go for distance and was going to do 7 miles, but then my weather app (and my observations) said it was going to rain, so I went home. No rain. So did I redeem any further time? I did not. I read a book. Oh yeah, and I finally did something about the background on this blog. Two of my favorite people came across on the ferry last night. 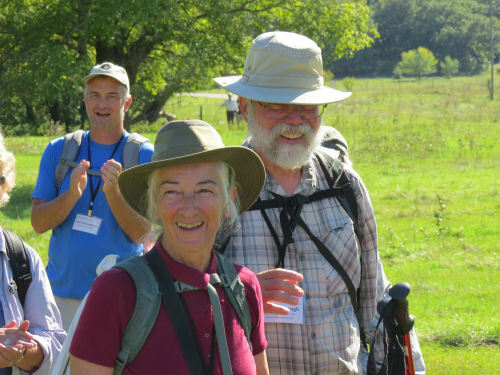 They'd been hiking the Ice Age Trail in Wisconsin, and they asked me if I wanted to go to breakfast with them. Of course! This is when they finished hiking the Buckeye Trail. I wanted to kidnap them and go hiking, but they had a commitment in Lowell. P.S. We went to Chef John's in Ludington. The breakfast sandwich was wonderful! It was enough food for me for the whole day with a little dessert this evening. In other news: I walked 3 miles with 30 pounds. I finished a chapter in Dead Mule Swamp Mistletoe. I started trying to find out how much it's going to cost to print North Country Quest with color interior pages. No other hike prep happened. Grocery shopping and more errands- they never end. Orange and black are colors of warning, "aposematic," at least in the insect world. They usually mean "I don't taste good and will make you sick" to other insects and birds. In fact, some insects have adapted to use the colors when they don't taste bad at all, but the warning still works. 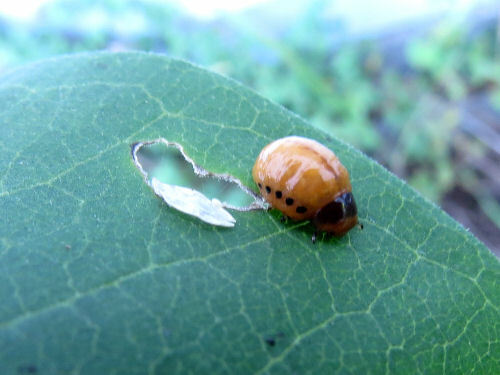 Today I found two of these little larvae on some milkweed. 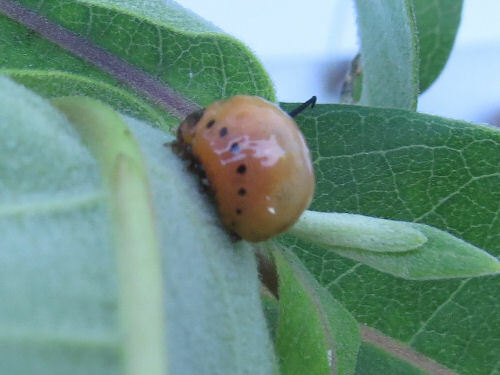 It will become the Swamp Milkweed Leaf Beetle, Labidomera clivicollis, which is-- you guessed it-- orange and black. This is common milkweed, but they aren't too picky although they prefer swamp milkweed. 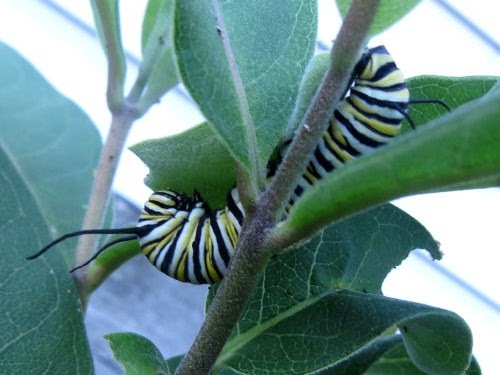 They can chew through a lot of milkweed, but they are native, so I'll let them live. I did learn that you want to be careful to never get milkweed sap in an eye-- it can cause severe inflammation and blurred vision for days. You'd think with all the bad press giant hogweed is getting that someone would mention the danger of this common plant. I also can't believe I've never had this happen, since I rub my eyes way too much. 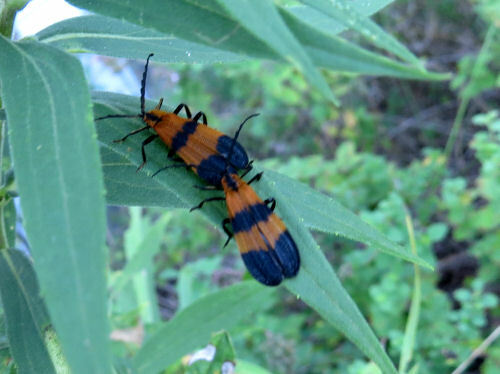 Right next door on a goldenrod were some End Band Net-wing beetles, adults, Calopteron terminale. Ah! I did find what I was looking for-- a Monarch caterpillar. In other news: I started planning hike food, but didn't get enough done to bother to share yet. Walked 4 miles with 26 pounds. Oof. I'm not in very good shape. Started writing the next chapter of DMS Mistletoe. Oh yeah, and I did laundry. OK, I've been reluctant to talk about this hike because it's a bit of a stretch for me, and I'm not 100% confident I can actually do this. But I know you'll be rooting for me if I let you in on the plan. 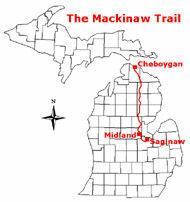 There is an historic Native American route from approximately Midland, Michigan to the Straits of Mackinac. The Boy Scouts set about restoring this route to some degree of walkability a number of years ago. It's now called the Midland to Mackinac Trail. Here's a small locator map that shows the route starting in Saginaw and going to Cheboygan. 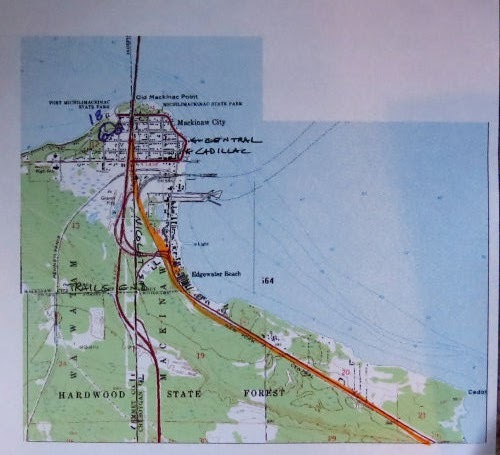 The "new" M2M trail goes from just north of Midland to downtown Mackinaw City. This is 210 miles. In terms of terrain, this is not a difficult route. A lot of it is even on old two-tracks or abandoned roads and railroads. 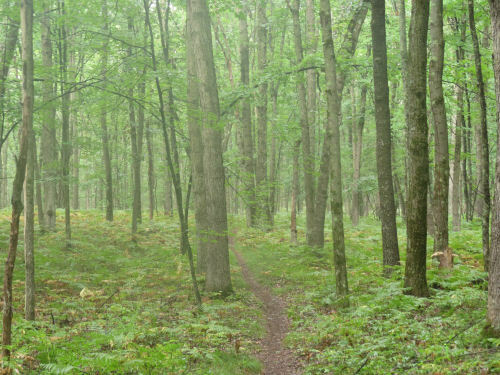 However, it is almost entirely through National and State forest lands, surprisingly remote even in Michigan. Not what most people think of at all for the Lower Peninsula. There are also not enough people who can put in the time to help maintain it. 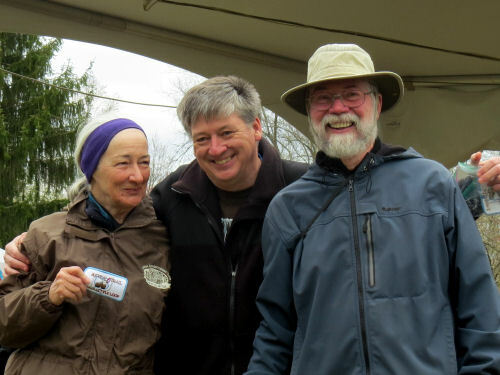 The friends I hiked with last week, Connie and Jerry, are two of the people who spend countless hours clearing brush, painting blazes, and attempting to preserve the trail for humans instead of beavers. 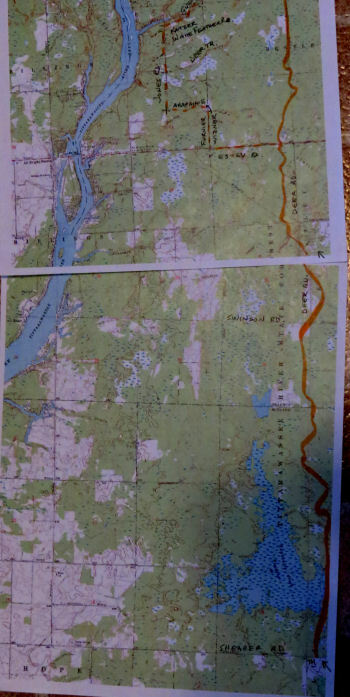 If you've been around this blog or me for a while, you know I always print a set of USGS topographic maps for every major hike I take and try to become familiar with the route ahead of time. I mark the roads, the trail (as best I can determine), water sources, etc. I create an itinerary with campsites that I hope to make each night. The orange line is the trail route. It's not very detailed, because I had to extrapolate from the official map, which is at a much rougher scale. But this will get me close, and I can "see" what's around me. Ideally, the orange line would be in the center of the map, but this first part isn't tricky, so I wasn't willing to rework and reprint this map. Then, as you may know, I like to spread them out with the orange line connecting. Well! Usually my hikes are one room length long. This one is two-plus lengths. 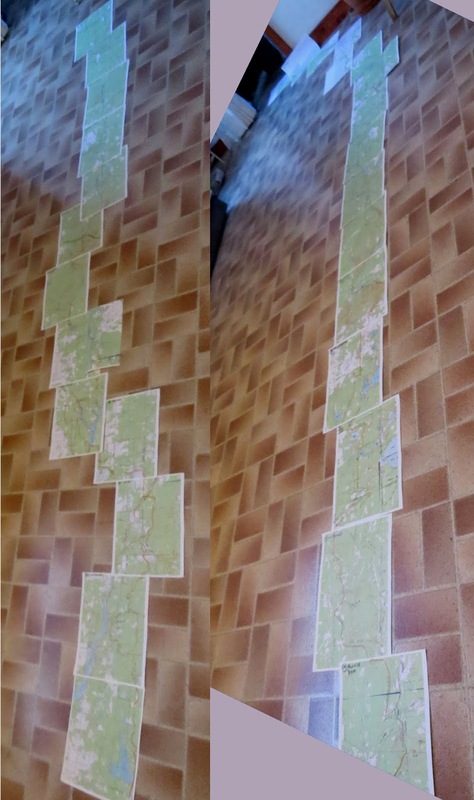 I put the two strips together in one picture. I'll hike from the bottom to the top of the left strip and two pages more on the right strip. 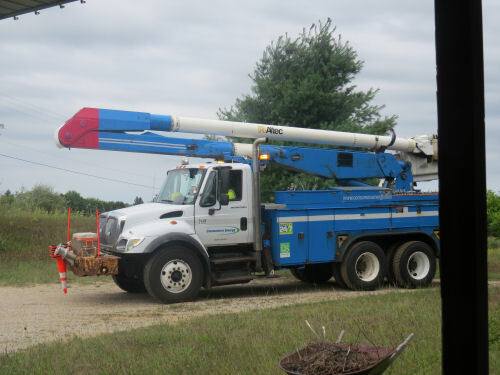 Then Connie and Jerry are going to pick me up for a day off to resupply and get cleaned up, and then put me back out the next day to finish the right hand strip. I start September 16, and will end in Mackinaw City on October 3. Assuming I can do it all. Why might I not be able to? Well, you all think I'm in great shape, and OK... I'm not in bad shape, but this will be the longest solo trek I've taken. It doesn't worry me that I'll be alone, but sometimes two people can encourage each other and keep up the pace. I'm also nursing a knee that I stretched a month ago. It's close to 100%, but if it decides to go south on me, I might have to bail out. That would not make me happy, but I'm not interested in really damaging something. Also, the trail may present me with surprises. It's not hiked in its entirety very much. 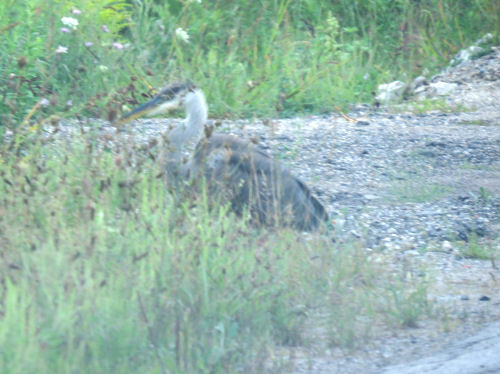 For example, Jerry has already scouted out a beaver problem area and I know before I ever start that I will need to take a road walk around a flooded area that there is no way to hike through. 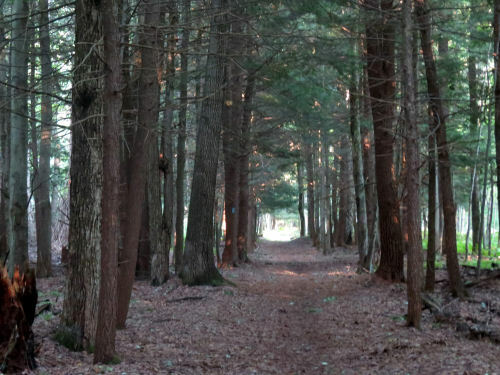 If I discover other places like this as I go, the solution will probably involve backtracking, finding alternate routes and then connecting back to the trail. All on foot. The last three days are pretty easy on rail-trail, so if I make it to Waveland (don't bother to look it up, it's a defunct railroad town), I should be golden to finish! I do need to get up to "speed" for carrying about 38 pounds. That would be a maximum weight on each "first day" with all water bottles full and 8 days of food. I'll eat about 1 1/4 pounds of food per day. I'm really imposing on Connie and Jerry for tons of advance planning help. They keep telling me they like to do it. Hope so, because I'm rather an obsessive planner. But I seldom have big issues once I'm out there. There is a lot to do to get ready in addition to spiffing up some of my gear. I'm sure you'll be hearing about it!